In today’s competitive market, people are lacking behind in time to complete their routine. Hence, it is important to have time-saving technology in places wherever possible – be it a loan processing system or anything that is similar. Manual processing in financial and banking sectors often results in delayed processing. Especially, when it comes to loan management system – handling huge amount of data will slow down the entire process. The best way to eliminate all the issues in the loan processing system is to automate it. Cloud-based loan management software speed-ups the entire process and eliminates the overheads. It helps to streamline, manage, and automate the entire loan processing system. The cloud computing technology has transformed the lending industry as well and now, lenders and borrowers are getting benefited from it. Now that the cloud-based loan processing system has come into existence and this has transformed the process to a whole new level. Ranging from loan origination to loan servicing, cloud computing is making these services available to a broad range of clients. Automation of loan processing system creates a positive impact for both the lenders as well as the borrowers. It provides a better experience for the customers by making the process simple. Also, this has streamlined the loan process and helps to meet business goals. Cloud-based loan management platform is a boon to financial organizations and eases out the entire process. The major advantage of this platform is that it helps you to manage a large number of data sets efficiently without costing you much money. With everyone business going digital, cloud platforms have become prominent and play an essential role in all the business sectors. The financial sector is no exception. In fact, cloud-based solutions are transforming the finance sector with a new perspective and solutions. Use of cloud-based solutions has resulted in better management of the lending process and involves less paperwork. Also, the entire process from loan origination to loan servicing is completely streamlined. Cloud-based loan processing system is a way more secure than the manual system and offers extra security to the users/customers. The customer support services are extended for 24/7 and thus, this adds an entirely new dimension to the concept. With the use of cloud-based loan processing system, banking and financial organizations can surely gain an edge over their major competitors. This also helps organizations to bring in dynamic work culture in the marketplace. Cloud computing technology has the potential to transform the financial services business by completely reinventing the business model. It helps lending organizations to connect easily with their customers. At the same time, business needs are met in a shorter time within a limited budget. This makes lending organizations focus on their business innovation, thereby building greater customer experience. A manual or traditional loan processing system is time-consuming and requires a lot of manpower. Cloud-based loan processing system helps you to overcome all these issues and reduces the overall processing time. In a manual-processing system, lenders usually charge a higher processing fee, but when using a cloud-based system, all these overheads and other costs can be cut-off eventually. Moreover, with the cloud, you can offer more and more services to your customers across multiple channels. The overall processing time, paperwork, error-rate, and other issues including a huge amount of manpower, workplace, etc can be reduced. Lenders need not spend long-time for completing the process and can easily get their loan amount. With the use of cloud-based loan processing system, the documents are secured and are stored in a centralized system. All your data can be stored in a single place in an encrypted format. A cloud-based system includes real-time features like sharing, updating, and automatic creation, storage, and sharing of documents as well. By this way, the entire loan management process is streamlined, and all related documents are managed using a cloud-based system. Cloud-based loan processing system operates at a faster rate when compared to manual loan processing system. This loan processing system can be implemented quickly, and you need not download the software. One major advantage of cloud-based loan processing system is that it can be easily configured and implemented within a short span of time. The software is completely configured and is available for the user instantly and securely in through the web browser. Another key advantage is employees who are willing to work from a remote location can easily get connected. Cloud technology also allows the users to fix the bug, update their software, and add feature enhancements as well. This improves the overall efficiency of the application. During the time of high demand, your loan management system may crash. This may happen due to the following reasons – hardware failure, power failure, process overload, and other potentially crippling factors. This may lead to loss or unavailability of data. All these issues can be eliminated by using cloud-based loan processing system. The data and other resources are stored in a centralized server and are available round the clock. They have centralized data centers that store the data from the loan management system. Other than this, the system also holds backup generators, storage hardware, failover clusters, and dedicated communication channels to host the loan management software. This makes the entire system reliable to the user. A major advantage of using cloud-based loan management software is that all the data are stored in a remote, centralized server. Nothing is stored on your local hard drive and it can be easily accessible from any device, any location, and at any time. Data stored in cloud storage are accessed via the Internet and are managed by the cloud service provider. Also, data in the cloud are stored in an encrypted format – this means data is secure and integrity can be maintained. Having several products and service offerings boosts the chances of maintaining a stable and long-lasting customer relationship. Use of digital loan origination process with a cloud-based system would result in the automation of all the processes. Several manual processes such as document processing, underwriting loans, and verification of the borrower can be automated. This would result in adequate time for both borrowers as well as lenders. Also, this would provide room for more loan products from financial organizations. The use of cloud-based loan management software has made the entire loan origination process simple. The borrowers can easily request for a loan through online and get their request approved quickly. By developing a member identification system with the help of Blockchain networks, communication between the lender and the borrower can be established. Digital ID’s can be created, and user details can be submitted through it. Information such as income, account balance, mortgage history, credit score, loan balance, and much more. This information is stored in a cloud-based system and financial institutions can use this data to cross-check, validate, authenticate user credentials. Based on the borrower’s loan history and credit score, his/her loan request gets processed. Cloud technology has drastically transformed various industry sectors, and the lending industry is no exception. The features, capabilities, and benefits that the cloud-based loan system offers are undisputed. 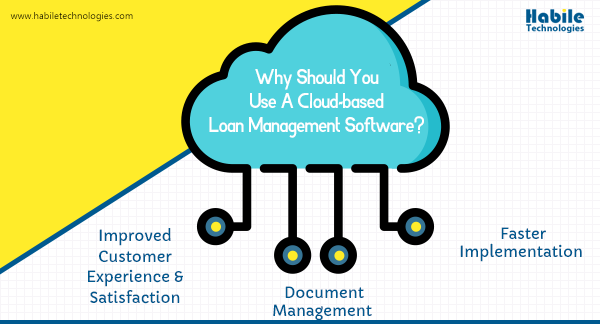 Some of the compelling benefits of cloud-based loan management software include lower capital and less operational costs, and high process efficiency. Another key fact is that cloud-based loan management software can be customized based on the organization’s needs. Also, it comes with advanced credit rating and scoring software. The highly automated cloud-based system makes the entire loan origination process simpler and keeps the data secure. Thus, switching to cloud-based loan management system would employ the top-line security features keeping the system and data highly secured.